A New Hieroglyphical Bible for the Amusement & Instruction of Children: Being a Selection of the Most Useful Lessons, and Most Interesting Narratives; (Scripturally Arranged) from Genesis to the Revelations: Embellished with Familiar Figures & Striking Emblems Neatly Engraved: to the Whole is Added a Sketch of the Life of Our Blessed Saviour, the Holy Apostles, &c.: Recommended by the Revd. Rowland Hill M.A. 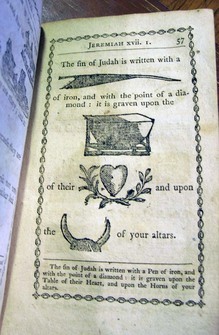 (Boston: Printed for W. Norman book & chartseller, [1794?]). 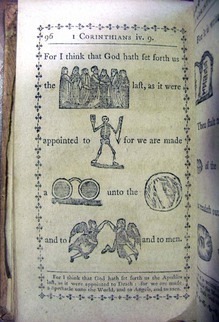 Contains a folding copper plate frontispiece and a copper engraved title page, and numerous woodcuts in the text. Sinclair Hamilton Collection of American Illustrated Books. Hamilton 153. While this is the first American edition of the New Hieroglyphical Bible, it is not the first American hieroglyphical bible. 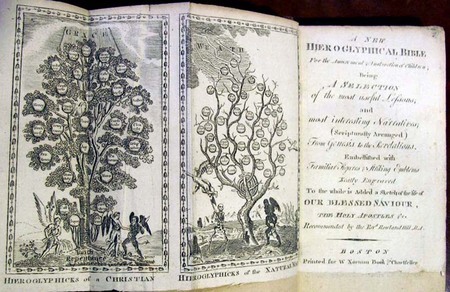 Boston publisher Isaiah Thomas printed A Curious Hieroglyphick Bible in 1788 (also in the Hamilton collection). These are both copies of English editions, the first of which was printed in London by Thomas Hodgson in 1780. So far, no one has found a copy of that book. You might also call it a rebus bible, as pictures are substituted for words. There is a key at the bottom of each page in case you cannot guess what a picture represents. 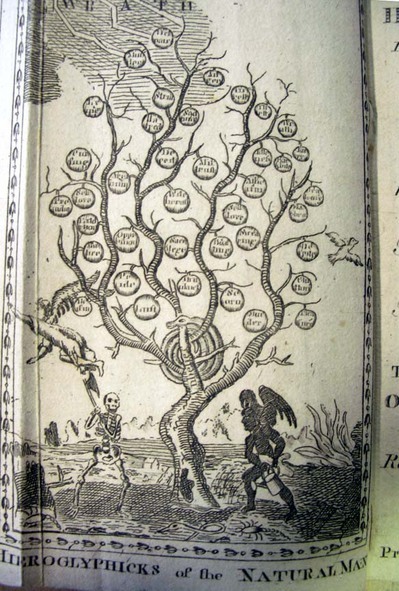 Meant primarily for children, the book was used to teach reading while at the same time, give religious instruction.